Baltimore-firm Warhorse and Virginia-based FD Stonewater have selected MacKenzie Management Company, LLC, to provide property management and maintenance services for their projects, Belvedere Square and Franklin Ridge, respectively.The addition of the two projects adds more than 250,000 square feet to MacKenzie’s portfolio, which now totals nearly 6.75 million square feet. 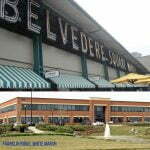 Purchased by Warhorse in June 2013, Belvedere Square is a 110,000 square foot retail center and a Baltimore icon. Known to many as North Baltimore’s gathering spot, Belvedere Square is at the crossroads of it all, located at the southeast corner of York Road and Northern Parkway. The project has a reputation for bringing together emerging artisans, boutiques, and family favorites, creating a dynamic mix of retail shopping, dining, and convenient service options. MacKenzie’s brokerage division, MacKenzie Commercial Real Estate Services, LLC, is currently providing leasing services for the project. Situated in the heart of the White Marsh business community, Franklin Ridge consists of three buildings located at 9910, 9920, and 9930 Franklin Square Drive totaling approximately 140,000 square feet. Currently fully leased, the project’s tenants include Johns Hopkins, Staryer University, and The Traffic Group. FD Stonewater, a boutique real estate brokerage, investment, development, and asset management firm out of Virginia purchased the project in November. “We are excited to work with both owners, and we are honored that they have entrusted our team to maintain the value and integrity of their assets,” stated Brendan Gill, President of MacKenzie Management Company, LLC. Property management services will include managing both the day-to-day physical management of the property, as well as financial management of the investments. These responsibilities will comprise lease abstraction and administration, accounts payable and receivable, reporting, contracting and oversight of third-party service providers, and supervision and maintenance of the building systems. Through a comprehensive tenant retention program, MacKenzie will address day-to-day concerns of existing tenants, work in conjunction with the leasing team to attract new tenants, and provide first point of contact for all tenant-related concerns, enhancing landlord/tenant relations and ultimately strengthening the buildings’ long term financial health. For more information on MacKenzie’s property management services, please contact Brendan Gill at 410-494-4889 or bgill@mackenziemanagement.com.